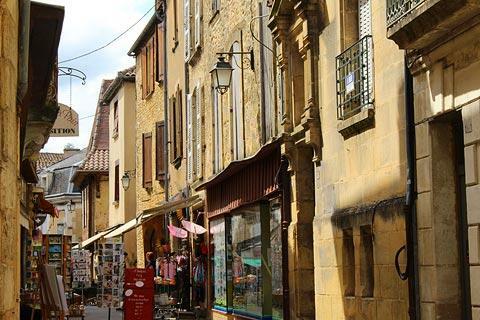 The village of Belves is situated 15 kilometres north of Monpazier, and 20 kilometers south of Sarlat, in the Dordogne department. 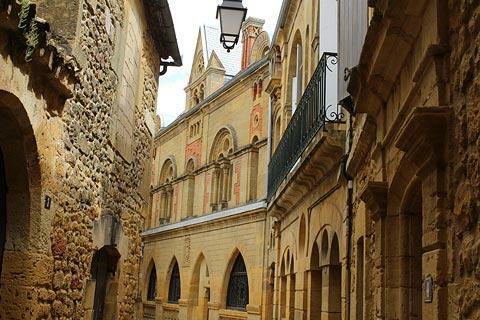 A lively and attractive bastide town, Belves is well preserved with lots of medieval features intact and is officially classified as one of the 'most beautiful villages of France'. 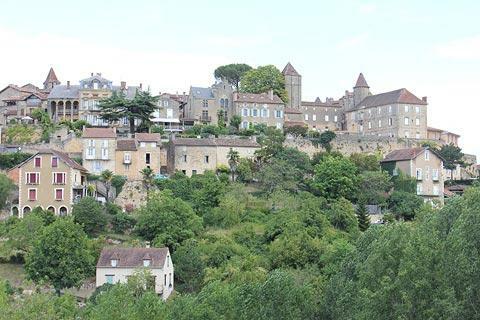 Like many of the towns in the region, Belves was constructed up the side of a steep rocky outcrop, giving it fine open views across the countryside. 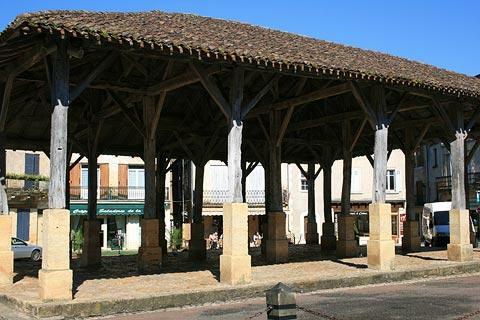 Although the site has been occupied for more than 2000 years, the village we see today has its origins in the 11th century, when it was founded as an English bastide town (at that time the English occupied a large part of Aquitaine, until they were driven out in the Hundred Years War, in the 14th-15th centuries). 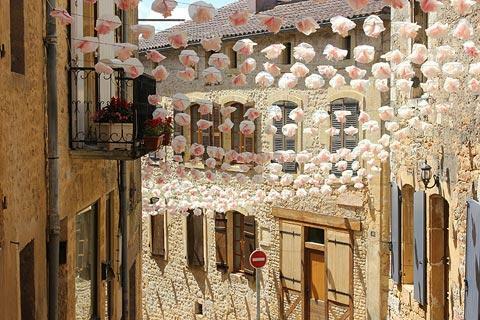 France This Way comment: just in case it isn't obvious from our description below, Belvès is one of our favourite towns in the region and well worth a visit! There are two car parks close to the centre so parking is not usually a problem in Belves. 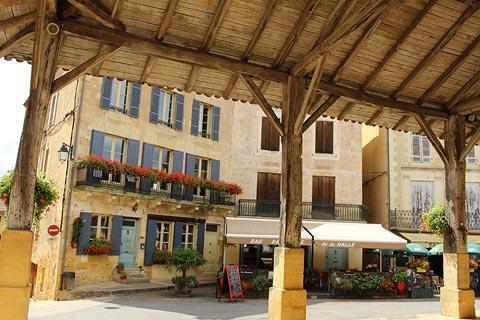 Start your visit in the Place des Armes, the original centre of the town. 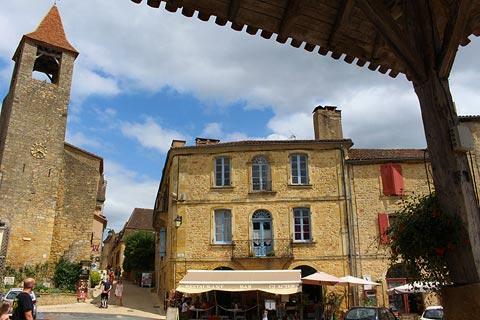 In the centre of the square you can see the 15th century covered market, while around the edges there are medieval houses, and part of the ramparts containing an original gateway into the town centre. There is also a cafe and the Belves tourist office on the square. 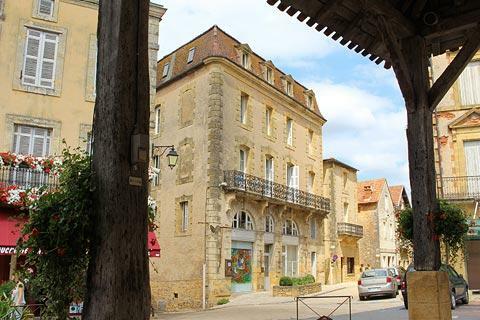 To the bottom of the square (the side opposite Belves tourist office) is the street with most of the shops and cafes, and the Hotel Bontemps - an especially unusual building that dates from the 12th century but had a renaissance facade added to the front in the 16th century. Be sure to spend some time exploring the side streets - many have houses with interesting features such as ornately carved stonework around the doorways. 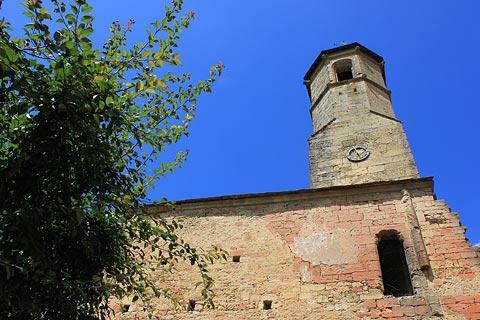 Also in Belves you will see the medieval walls and belfry, the city hall, a 16th century castle and a medieval convent. Belves is also known as the 'town of seven bell towers' - among the most important are the 11th century 'Tour de l'Auditeur', a substantial square tower; and the Tour des Filhols, an 11th century tower above the Belves tourist office (note also the maison des Consuls, built in the 15th century and part of the same building). The main church here - the Church of Notre-Dame de l'Assomption - dates from the 13th century, although the belltower was added in the 15th century. Step inside the church to see the organ. 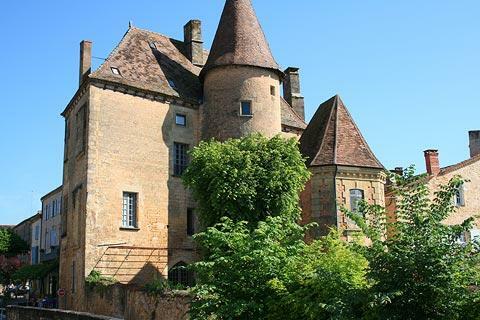 In the centre of the town, below the 'Place des Armes', you can visit troglodyte dwellings. 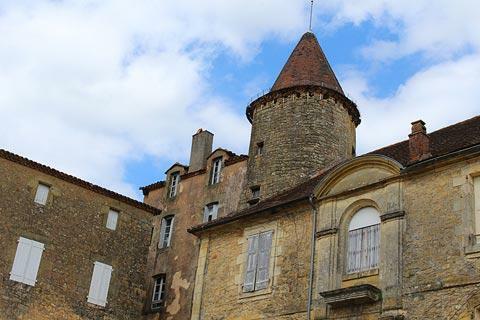 These date from the 13th century onwards and provide a fascinating glimpse into life as it was in the medieval town. The caves include ancient doorways and ladders, walls carved from the stone and items of furniture that all help to enhance the visitor experience. Enter the troglodyte caves just next to the stone arch in the main square. 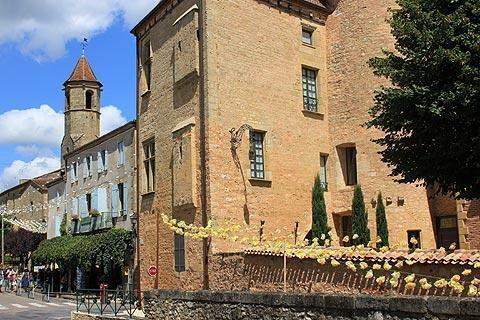 One event not to be missed in belves is the annual 'medieval festival' which takes place in early August. 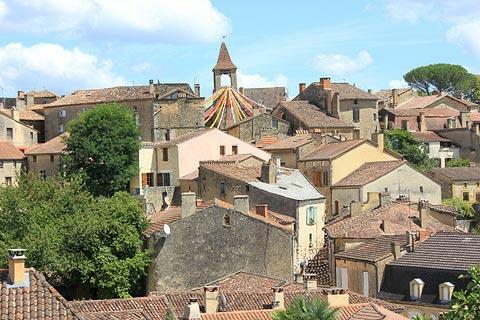 During the festival the town reverts briefly to the 15th century, with everything from jugglers to falconry on display and really is successful at taking you back in time despite the visitor numbers! Head a little way out along the road towards Monpazier for the best view of the village as a whole. 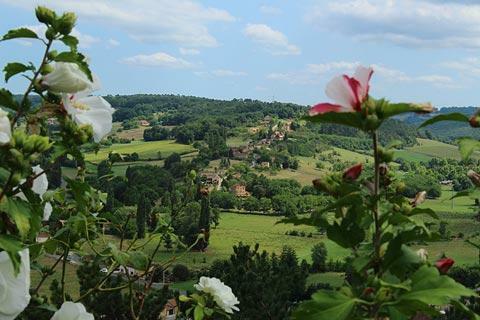 There is a great deal to enjoy in the surrounding countryside, since Belves is within easy reach of the numerous sites in the Dordogne to the north, such as prehistoric caves and traditional towns and villages and the historical bastide towns such as Villereal, Monflanquin and Monpazier to the south. Your only problem is deciding which you don't have time to visit!